We visited this park on September 6, 2016, and stayed for 4 day(s). 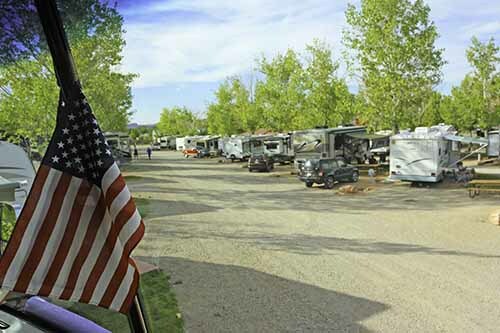 Spanish Trail RV Park is a convenient and pleasant place to stay while visiting Moab area attractions. All but a few of their sites are pull-through, 50 AMP, and full-hookup. Each site has a picnic table, a sidewalk, and a small grass yard. 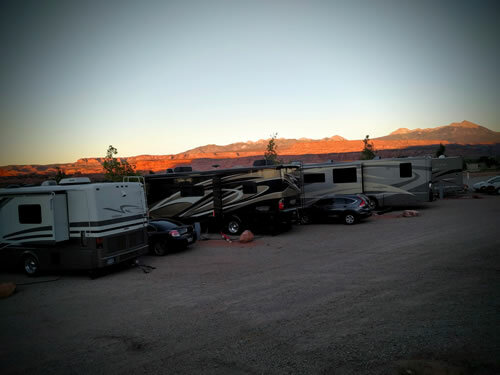 Each row of sites is terraced, providing a view from your front window of the red-rock cliffs this area is known for. The setting sun bathes the cliffs in color each evening. After sunset, look up. The night sky in this area is spectacular. The park has no pool, but there is a laundry room and small store. We had no need of either for our short stay. Cable TV and Wi-Fi is included at no additional fee, but the Wi-Fi signal was poor at our site. This park is popular, so be sure to make a reservation in advance. They do not honor any discounts beginning September 1 of each year. It’s not an inexpensive place to stay at nearly $50/night once taxes are added to the bill, but every once in a while, we’ll splurge and this was worth it.